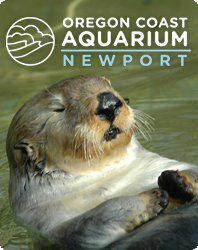 The Oregon Coast Aquarium in Newport opened on May 23, 1992 (Eugene Register-Guard, 24-May-1992). A pair of frolicking sea otters rescued from the Exxon Valdez oil spill in Alaska upstaged politicians Saturday at formal opening ceremonies for the Oregon Coast Aquarium. Most of the aquarium’s exhibits focus on the native flora and fauna of the Oregon Coast, e.g. seals and sea lions, giant pacific octopus, sea bird aviary, and the aforementioned sea otters. The Oregon Coast Aquarium is one of Oregon’s top tourist attractions, hosting over 40,000 student visitors a year.